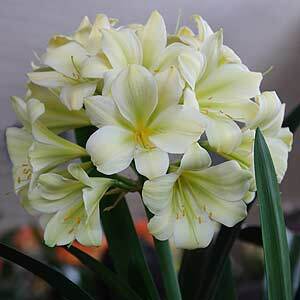 A variety of Clivia plants are available from wholesale growers both as potted specimens and as bare rooted plants. Sold in bulk for mass planting, the more common varieties have a number of uses in landscaping. Used in shaded areas as fillers or as ground cover plants in broader landscaping projects. They are also suited for use as feature plants especially those with improved flower forms. An increasing number of varieties are available including Clivia miniata, gardenii, Clivia robusta as well as yellow flowering Clivia and others. Generally available from growers as seedlings through to potted specimens in 100 -250mm pots. Excellent flowering and foliage plant for dry shade. Can be mass planted as a ground cover plant. Most varieties offered by wholesalers are cultivars. Orange and yellow flowering types are readily available. Rarer types with pastel and even green flowers are available from specialist wholesale growers. Wholesale nursery specialising in Drought Tolerant Plants including: Aloes, Strelitzia, Clivia and Agapanthus .